Tomorrow afternoon I will be landing at The Ace Hotel in Palm Springs to spend a couple nights hanging with some talented designer ladies in the sun and by the pool. I truly look forward to attending DesignerVaca after attending last year. It was a very rejuvenating and clarifying time for me at a time I really needed it. Coming off almost 4 weeks straight of travel I feel like having 2 days to relax a little and talk shop with other ladies who are chasing a similar dream will be just what I need before I head home and we prep to tie up 2 of our largest projects of the year and pack our house up to move to North Carolina. When I left Traverse over 2 weeks ago to head to Texas I packed everything I would need to also head to Palm Springs directly from here. Mike is taking back all of the things I don’t need for California and I am sporting a backpack and a tote to get me through my trip. 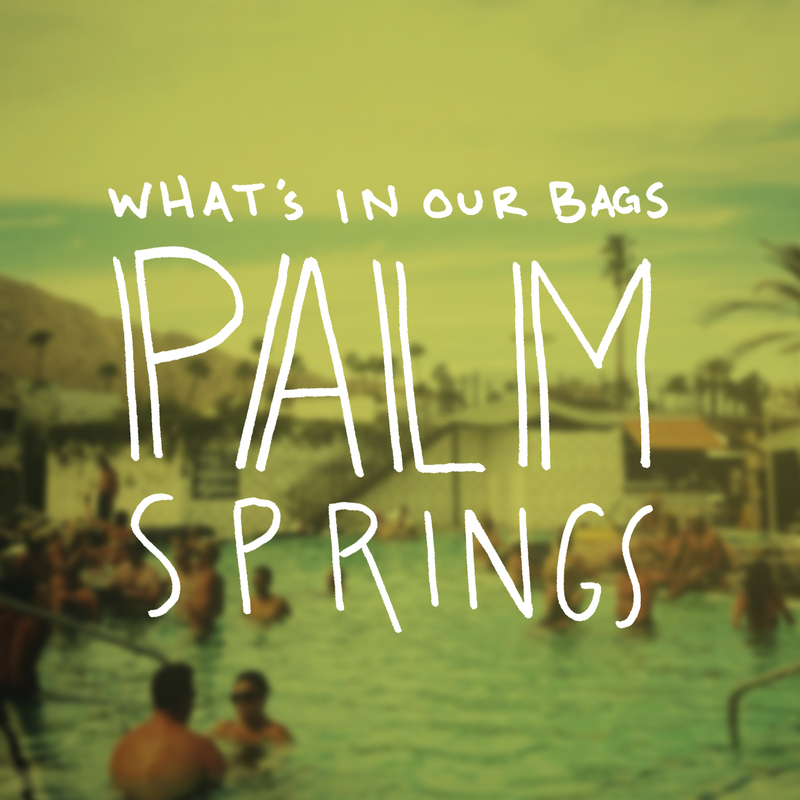 I thought since many of you enjoyed my South Africa What’s in our Bag post…I would share what I will packing for Palm Springs this time. Mike won’t be coming and instead is heading home to attend a launch of another company he owns and is also going to get to see our pups (I am a little jealous of that I have to say!). So he won’t be sharing his things for Palm Springs, but maybe another time! Here is what I am packing in my bag and tote to head to the Ace tomorrow. 1. Maxi Dress: Easy to wear out for dinner or wear by the pool. Also easy to throw on for breakfast. 2. Sunnies: You are in the land of the sun and in a desert. There is no way you can go without your sunnies. 3. Denim Vest: The perfect thing to layer in the evenings or throw on with your shorts over your bathing suit. It is a great piece to have. 4. 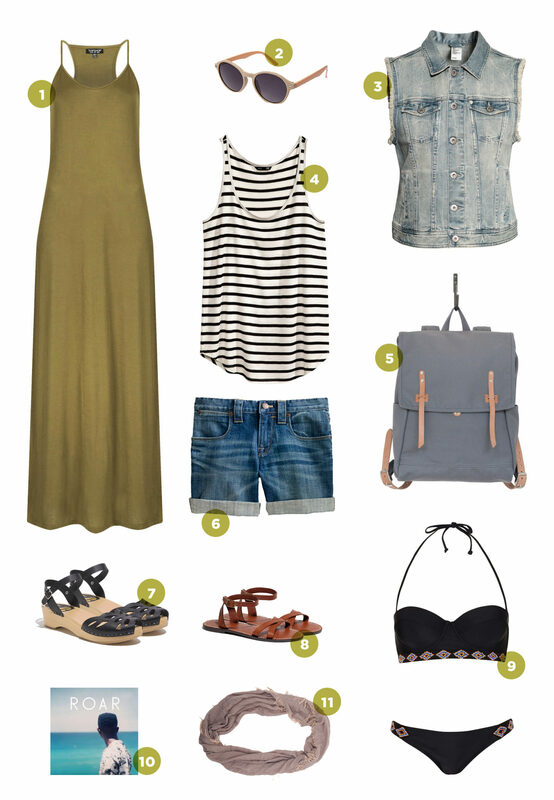 Simple Tank: Something that can layer easy over your bathing suit or over your maxi dress. 5. Backpack: Pack it all in here. 6. Denim Shorts: Denim shorts are easy to dress up and down and are quick to dry because they are cotton so they make a great thing to have in a place where you are in and out of the water so much. 8. Basic Leather Sandal: the shoe you will wear every day. It is honestly easy to just get away with just one pair of shoes if need be. 9. Multi-ware Bathing Suit: You will be wearing a bathing suit each day so you better have a good one. 10. Dirty Gold – Roar Album: You need music to prep you on your flight and to enjoy by the pool while you nap, right?! This one is my pick. 11. Lightweight Scarf: It gets chilly in the evenings a little so it is nice to have pieces to layer that are lightweight. Also on the flight home it will be nice to have one to cover you up for the overnight flight back to the east coast. Watch my instagram and the hashtag #designervaca to get all the scoop on what we are up to while hanging at the Ace. Excited to see so many awesome ladies. I am anxious to see you sport that cut-off jean jacket! In the midst of trying to find the “perfect” jean jacket, I acquired a few too many jean jackets. I have one to spare that I’ve been wanting to cut off the sleeves, but I can’t find too many examples of how I can look cute wearing it… looking forward to your next few posts! This is basically my entire wardrobe, ha. Great outfits for Palm Springs! I can’t wait until the Ace Hotel comes to Los Angeles! Hopefully you’ll have time to visit Joshua Tree National Park. You will love it there, and your pictures will be awesome! I went to Joshua Tree in College and camped. LOVED IT! A fave place for sure!!!! Very inspiring. Would go back in a heart beat if I had the chance. Have an awesome, relaxing time!